I am delighted to introduce this first edition of the UPTIME newsletter. UPTIME - Unified Predictive Maintenance System - is an EU Horizon 2020 funded project, which aims to develop a predictive maintenance system for the manufacturing industry. 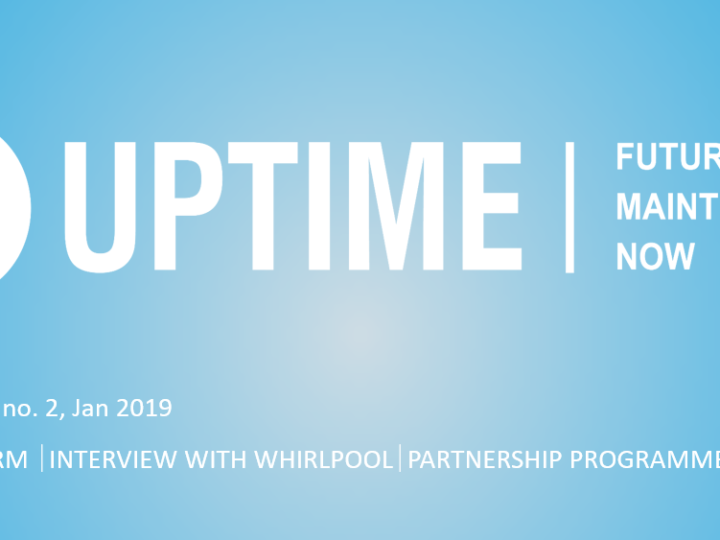 We intend to make this newsletter a regular publication and to use it to keep you in touch with news and developments related to the UPTIME project and its progress. In this and future editions, we shall be reporting our progress in the technological implementation of UPTIME modules in different business cases as well as upcoming activities of the UPTIME community programme. We hope that you will find our newsletter interesting and useful. Maximize utilization of equipment at the risk of downtime (“run until it breaks”) or minimize unplanned downtime through early and frequent replacement of new parts („fix it regardless“)? No more dilemmas between a costly and an inefficient approach for maintenance and reliability engineers. UPTIME provides next-generation predictive maintenance aiming to optimize in-service efficiency, to self-improve over time and adapt to dynamic manufacturing environments. It proposes a novel predictive maintenance management model along with an associated information system. UPTIME unifies operational intelligence and business analytics in the context of Industry 4.0 in order to provide visibility and insights into data and maintenance operations. This unification not only enables observing deviations in the manufacturing processes, but also predicting failures, deciding optimal maintenance plans and acting ahead of time, in a proactive way. With UPTIME, manufacturing firms are able to harness different technologies, data sources (e.g. sensors, SCADA, PLC, asset management systems) and expert knowledge in order to drive maintenance operations through better decisions. Moreover, UPTIME follows a data-driven approach, which makes it applicable to every kind of equipment and industry regardless of their production processes and physical models. The UPTIME framework will be deployed and validated against three industrial use cases: (1) production and logistics systems in the aviation sector, (2) white goods production line and (3) cold rolling line for steel straps. In this newsletter's edition, we interviewed a project partner from FFT Produktionssyteme GmbH & Co. KG, Jeroen Versteeg, Senior Project Manager of FFT Aviation Systems & Test Operations Division based in Bremen. He shared his views with us on the benefits of predictive maintenance in large transportation asset operations. How has FFT performed maintenance activities so far? FFT's division Systems & Test Operations has a growing number of maintenance projects, currently particularly in the aerospace industry, which in part involve larger numbers of highly complex assets, some of which are mobile and subjected to diverse environments and a wide range of unpredictable environmental stress factors. Due to the critical nature of the deployment of these assets, the requirements are both technically and organisationally very high. The need has arisen to increase efficiency in maintenance execution as well as in reporting to the client, who in most of our projects is responsible for the logistics coordination of their assets. Until recently, maintenance has been performed relatively conventionally, although improvements in the area of automated asset and activity tracking have been implemented. Thus, it is FFT's expectation that UPTIME can provide the framework to implement highly automated workflows to achieve an increase in efficiency. How will UPTIME improve your maintenance service performance? The improvements promised by UPTIME are expected to bring benefits to our maintenance service performance. This will affect all major processes: planning, execution, reporting, evaluation, improvement. This will be achievable because all information necessary for these processes will not only be acquired using various (mostly automatic) means, but also made accessible to the process stakeholders on-demand and in the form they can most effectively process. A logistics planner, for example, would have access to an overview indicating location and availability status (e.g. "under maintenance, expected to be ready in three hours") of an asset, while our maintenance operations manager could see a summary of anomalies in environmental stress for an asset necessitating ordering of certain spare parts in advance, which could dramatically decrease the down time of the asset. Also, the availability of historical data and effective evaluation and representation methods for this data is expected to show trends or areas of interest which can be used for continuous improvement of both maintenance of the assets and technical optimisation of the assets themselves. In summary, UPTIME is expected to enable our maintenance service to focus more on the primary maintenance processes by automating secondary processes such as data acquisition, processing and reporting, while continuously providing relevant data to improve all processes. Exploiting data from manufacturing system health monitoring as well as from other sources is a promising way to improve Overall Equipment Effectiveness (OEE). The UPTIME project is building a complete e-platform, comprising innovative components, fully adaptable and configurable to meet the needs of various industrial contexts. The UPTIME platform is based on the most advanced standards of Industry 4.0. To provide industry access to UPTIME technology and expertise, and initiate a dialogue with experts in all sectors, we are preparing a Partner Programme beginning in November 2018. Membership in the Partner Programme is free of charge! What is the UPTIME Partner Programme? Our Partner Programme provides information, use cases analyses and assistance with the implementation of the UPTIME solution with proven benefits based on real industrial use cases. Software technology is provided free of charge. If you would like to participate in and benefit from new advances in predictive maintenance, join the UPTIME community! Stay informed by getting in touch with us here. Further information on the UPTIME Partner Programme will be available soon on our Website.